I based this recipe on one in my quick and easy Good Food book, which I love (and which the photo is of as I totally forgot to take a photo….again! Soz). All the recipes in there are, surprisingly, yep, quick and easy! They actually got the title right on this one. 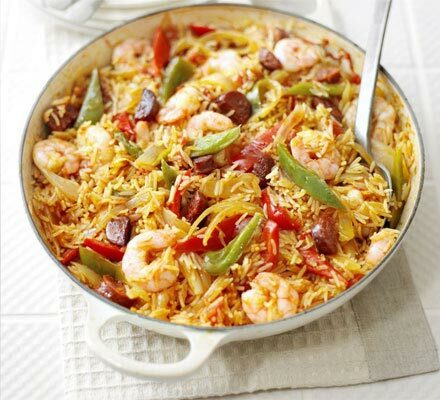 So tonight, we had Prawn and Chorizo Rice. I thought it would be a hit as both love all the ingredients, alas Boo decides that tonight is the night she doesn’t like Prawns any more, if it didn’t have Prawns in it would have got 10 hundred out of 10 – Woop! (when will she get it??)…. and Bear pipes up that he doesn’t like the see through bits in it (onion) so we spent a while trying to pick these out, not ideal when you’ve ‘finely chopped’ them! So got a 7/10 from him, with the promise that he ‘would definitely have it again if it didn’t have the see through bits in’. Lovely. 1 glass (or bottle…hic!) of red wine – it’s a Sunday, why the hell not! In another pan (small frying pan), add another knob of butter and fry off the chorizo for a minute or so. Keep stirring as if you’re doing a risotto, leaving to simmer for a minute or so and then a quick stir, keep going until the rice is almost done and add in the prawns at the last minute to heat through and season accordingly. I chose Basmati rice because it cooks quicker, this dish took me about 20 minutes, including prep, as the rice only took about 12 minutes to cook. Obviously you could also do this as a Risotto, which I think would be even nicer but my kids aren’t overly keen on Risotto rice, they prefer the normal kind so hence my choice. If I was cooking this for me and Beardy I’d probably also put a bit of chilli in. Original recipe from Good Food below.